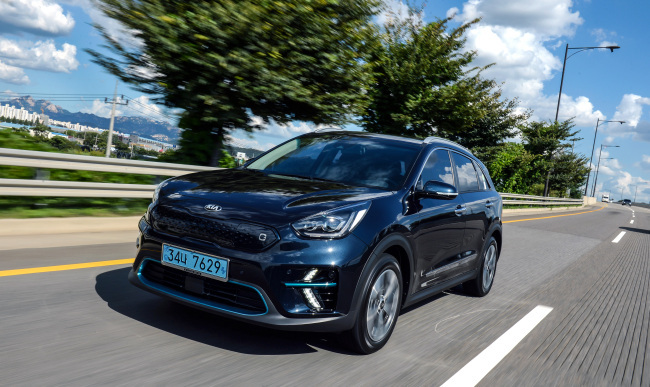 GONGJU, South Chungcheong Province -- Riding the wave of green cars, Kia Motors recently released its first fully electric vehicle, the Niro, highlighting its driving distance of 385 kilometers per charge -- enough to drive from Seoul to the southern port city Busan. South Korea’s roads, which until now have been packed with gasoline-powered sedans, mostly black or white in color, are going through a transition with the influx of eco-friendly cars such as electric vehicles, plug-in hybrid electric vehicles and fuel-cell electric vehicles. The Niro EV joins a lineup of green cars from Kia Motors that also includes the Niro PHEV. The Korea Herald took the Niro EV out for a test drive last month to the city of Gongju, South Chungcheong Province, some 160 kilometers south of the capital, to examine the vehicle’s actual driving distance, charging time, charging cost and driving performance. The test drive from Seoul began with a driving distance of 330 kilometers, which dropped to 125 kilometers by the time the vehicle reached Gongju. Driving at high speeds on highways had consumed roughly 44 kilometers’ worth of energy in excess of the actual distance traveled. Unlike combustion-engine cars, which use less fuel on highways, the EV consumed more electricity because Kia’s regenerative braking system had fewer chances to recharge the battery. Defying the popular notion that EVs are unstable at high speeds, the Niro glided quietly on the highway at about 120 kilometers per hour, showing outstanding stability equivalent to that of sedans powered by combustion engines. It has an official 204 horsepower and 40.3 kilogram force-meter torque. The vehicle also produced less queasiness, a common phenomenon in EVs due to an accelerator that is designed to slow down quickly when the driver takes his or her foot off the pedal to reduce electricity consumption. In terms of charging, the pros and cons were clear: It was time-consuming, but highly affordable. At an EV charging station located in a public parking lot in Gyeryong, South Chungcheong Province, it took 39 minutes to charge 28.3 kilowatt-hours out of the 64-kilowatt-hour battery. A full charge would have taken about an hour and a half. For most drivers accustomed to fueling up their cars in a few minutes, the time required to charge an EV might come across as a downside. The tradeoff, however, was exceptional cost-effectiveness: It cost only 4,895 won ($4.30) to charge 28.3 kilowatt-hours, which converts to a driving distance of 170 kilometers. A full charge would have cost about 9,000 won, roughly one-tenth the cost of filling the gas tank in an average fuel-powered small to midsize sedan. It was fairly easy to find EV charging stations, with at least one available every 15 to 20 minutes at public parking lots, retail chains such as Lotte Mart and E-Mart, and some apartment complexes. The number of EV chargers was tallied at 5,886 nationwide as of June, more than eight times the number that existed in August 2016, which stood at 711, according to the Environment Ministry. The five-seater SUV is priced between 30 million won and 32.8 million won with the 17 million won green-car subsidy provided by the Seoul government. This year’s batch of EVs has already sold out and 8,500 units have been reserved for next year, the company said.